Today on the Doc On The Run podcast we’re talking about the top five ankle sprain myths for runners. Ankle sprains are one of the most common injuries that brings an athlete to the emergency room. Of course, as we talked about before, the emergency room may be the very worst place to go when you actually have an ankle sprain. 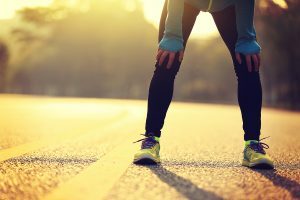 Since many runners are starting to learn that they don’t need to sit around all day in the emergency room it’s important to understand what is a myth and what is reality when it comes to a sprained ankle. If you understand a few simple things about ankle sprains you can make the best decisions about how to care for your ankle so you can get back to running as soon as possible. 1 . You need x-rays to see how bad it is. Anytime you roll you ankle on a trail run or miss a step and sprain your ankle, you want to know what is wrong. 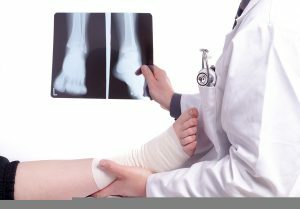 Of course, we expect that if you take x-rays you can look inside the ankle and see what is wrong. But that’s not really how it works. The first problem of course is that x-rays really only show you the bony structures. Ankle x-ray exams don’t really show tendons and ligaments or other soft tissues very well. So if you have a broken bone an x-ray is really useful. However most patients who sprain their ankles do not break anything at all that might show up on an x-ray. In fact there’s an entire set of criteria often used by emergency room physicians to determine whether or not it’s worth the cost of doing an x-ray when someone sprains an ankle. Those rules are known as the Ottawa ankle rules. They were developed in Canada to reduce healthcare costs when the Canadian Health System realized that thousands of patients every day were showing up in emergency rooms and getting unnecessary x-rays of their ankles. The Ottawa ankle rules basically say that if you can push on four different spots on your foot and ankle, and it doesn’t hurt when you push on any of those four spots, and if you can walk four steps or more… you probably don’t need x-rays. Now this set of guidelines will basically rule out all of the most common kinds of fractures that happen when you roll your ankle running. So the fact is you don’t really need x-rays in most cases. 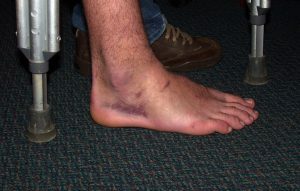 Now, having said that I have seen a number of patients who called me because they believed they had an ankle sprain. And when I examined these patients in their homes, it was clear that they actually had a fracture. The reason I knew these patients has broken bones is not because I did x-rays in their homes, but because I could actually feel the broken bone move when I checked their ankle. But this point shouldn’t confuse you. These patients were all in extraordinary amounts of pain, the ankles were black and blue and the ankles were severely swollen. So just on outward appearance, I was actually suspicious of a fracture. In these cases I ordered x-rays not to determine whether not the ankle was broken, but whether or not surgery would be required to repair the fractured bone. On the flip side of this idea of whether or not you need x-rays for an ankle sprain, there are subtle fracture patterns of the ankle that are very frequently missed. I am often invited to medical conferences to lecture to physicians and help them learn how to not miss these subtle fractures. One such fracture is called a lateral process fracture of the talus. I actually lead the largest research study ever performed on these types of fracture patterns. We actually found that in the case of ankle injuries suspected to be ankle sprains lateral process fractures are present almost 10% of the time! For that research we won an award from the American College of Foot and Ankle Surgeons. And even when doctors look at patients with ankle sprains it has been reported that these particular types of ankle fractures are missed 40 to 50% of the time. So even if you have x-rays they may well miss this fracture on the initial exam anyway. 2. If you can walk on it, it’s not broken. Another myth is that if you can walk on your foot and ankle it can’t be broken. And although I can understand why people would assume that you shouldn’t be able to walk on it if it’s broken, I can tell you that this myth is simply not true. I have seen many patients with truly remarkable, severe fractures who walked right into my office. In fact, a few of those fractures were so significant they had to be taken immediately to surgery! Our bodies are true remarkable machines and when a part, such as a bone in your ankle, becomes broken and injured natural endorphins can dull the pain. The muscles and tendons around the fracture can splint firmly enough to support the broken bone so it is stable enough that you can walk. So if you think you may have broken your ankle obviously you shouldn’t ignore it and just keep walking. You don’t have to be a doctor to understand that if you walk on a broken bone you can make the fracture worse. Grinding away the rough edges of a broken bone chewing away on each other is not going to make things better. 3. You should move it right away. One ankle sprain myth and treatment method which has been perpetuated for decades is that you should move your ankle right away after you sprain it. Believe it or not there is some scientific basis and reason to think this “early mobilization treatment” is a good idea. Many years ago there was a research study that actually reported that when athletes had a severe ankle sprain and started an early range of motion protocol in order to loosen up the ankle, reduce the swelling and remove the inflammatory fluid they could return to pre-injury levels of activity within four days. Four days sounds pretty good, right? The part that doesn’t seem to get discussed, or highlighted is that the overwhelming majority of athletes who took this approach actually end up with chronic ankle pain. That’s right…they have problems for years. Some of them have ankle pain for lifetime. So if you happen to be a professional athlete who is making hundreds of thousands, or millions of dollars, it may be worth taking this approach. In that case, you may choose to endure some long-term pain for an enormous short-term financial gain afforded by a professional athletic career. But for all of us normal individuals with regular careers and a desire to keep running and stay active for the rest of our lives, this seems like a terrible idea. Yes, it may be a real bummer to sit on the couch for a few days or a couple of weeks, but if it’s the difference between running with or without pain for the next few decades, it seems like it’s a good idea to treat the ankle appropriately, right off the bat. A simple way to think about it is to consider any sort of damage tissue…like skin. For example, let’s say you cut your arm. Would it make any sense to repeatedly pull the cut open? If you did that do you think it would heal quickly? All an ankle sprain is, is a ripped or torn ligament that supports the ankle. So if you tear the ligament and then you rapidly and repeatedly move the ankle around, how is that torn ligament supposed to heal? Do you really think new collagen can be laid down across a moving ligament? It just doesn’t make any sense. In terms of reviewing the medical literature studies have shown that there is a higher risk of chronic ankle pain after early mobilization versus immobilization with a cast or a fracture walking boot. The important point is you have to really think about what is most important. If you have a once-in-a-lifetime opportunity to run a race then maybe you can suffer the consequences of running on a sprained ankle. However, if your goal is really to make sure that you’re running without pain and without problems years from now, you may be better served with a short course of immobilization. 4 . If you can play, it’s okay. A couple of years ago I was in Yosemite on a rock climb with a friend of mine. While he was leading a short section, he fell. When he fell, he rolled his ankle. But he’s a tough guy. Sitting on a cliff, high above Yosemite Valley we talked about it. He seem to think that he was doing okay and so we continued on. But we were on a very long route called the Royal Arches. The problem with the Royal Arches is that at some point it starts to become very difficult to retreat and unfortunately once we passed that point of no return his ankle started to get considerably worse. Although he is very tough he was having a rough day. I could hear him repeatedly moaning and groaning when he would step on it the wrong way. Of course, this slowed us down more than we expected. We ran out of water. We both got dehydrated. The day turned into much more of an adventure than we had originally sought. The point of this story is that the initial ankle sprain injury may be followed by a flood of endorphins that can considerably dull the pain and make you think it is okay to continue on. But doing so may put you at risk of further problems. If you happen to have one of the subtle ankle fractures and you just keep moving you can make the injury worse. 5 . As long as I can run, it’s good. One statement that most runners would agree with is, “As long as I can run its good.” Of course, I agree with this statement to a point. Just as we have discussed, you could make an injury worse if you continue to exercise without treating it appropriately. But there’s an upside and a downside everything. One of the saving graces for athletes who take the early mobilization route is that even if they develop chronic ankle pain, inflammation and problems down the road, these problems are, for the most part, still treatable. 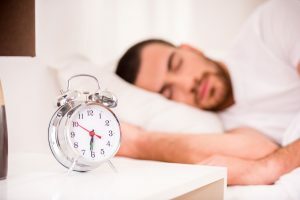 You must fully rehab it and rebuild the neuromuscular connection or you will sprain it again. A huge proportion of patients who sprain their ankles will develop chronic ankle instability that makes the injured ankle more susceptible to recurring ankle sprains. Of course, if you sprain your ankle it’s inconvenient because it interrupts your training. You find yourself sitting on the couch nursing your swollen ankle instead of going for a run. If you keep spraining your ankle over and over, seemingly every time you go out for a trail run, this is not going to be sustainable for most runners. But again the good news is most runners can fully rehabilitate their ankle even if they make some ankle treatment mistakes after that initial ankle sprain. So just because you sprained your ankle a year two ago don’t think you can’t improve it today. You just have to understand the process of rehabilitation so you can restore the natural stability to your ankle. And do not be confused. You don’t need surgery in the overwhelming majority of cases to rehabilitate your ankle. So don’t let some doctor sell you a trip to the operating room. Many runners can fully really rehabilitate a sprained and a chronically unstable ankle at home, with a very specific home exercise rehabilitation program. You just have to know what to do. Talus. Annual Scientific Meeting of the American College of Foot and Ankle Surgeons, Las Vegas, NV, March 20-24, 2006. Awarded 3rd Place, American College of Foot and Ankle Surgeons 2006 Scientific Research Competition, Institutional Category. J Ardèvol et al. ugly construction to get trailing dot after citation, or after journals slug if citation is not defined Knee Surg Sports Traumatol Arthrosc 10 (6), 371-377. 2002 Sep 13.